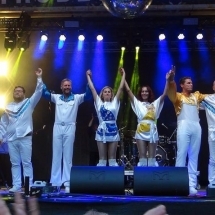 The high-level illusion of the biggest Swedish legend, was formed in 1999. Their first success was not long in coming. After only a short time found themselves in Spain, they traveled throughout the south-west coast of Europe. From 2000 to 2005 they traveled and toured continuously abroad. The basic quartet is supplemented by the bass guitar player and the drummer which makes the band to perform without any backing tracks, being completely live production. Six people singing on the stage, full vocal performance, perfect choreography in authentic costumes will make even greater impression of the concert. 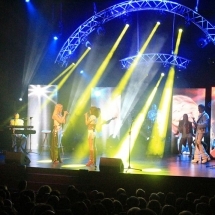 They have been recreating the magic of ABBA concerts throughout Europe in Spain, Portugal, France, Belgium, Estonia, Netherlands, Czech republic, Slovakia, Hungary and worldwide. More than half a million spectators at over two thousand concerts enjoyed the unique atmosphere of their production. Many times proven world show will take you to this wonderful, magical journey to yesterday.